Overall it was a decent game week with a good jump in position on the overall leaderboard. The transfers paid off to a certain extent with Sterling and Aguero picking up 18 points between them. I was still disappointed that Aguero didn’t get more against Burton though. Based on pushing for a place within the top 2,000 teams only a couple of weeks ago, I wouldn’t say I’m overly happy with my position at the moment. However I am happy with the team I’ve got – I can’t really see how it could be improved on at the moment so I think it is just going to be a case of hoping for a bit of luck over the next game week. Although I’m not overly hopeful due to the FA cup fixtures at the weekend. Clean sheet for Laporte. It’s good to see Man City back on track with clean sheets. Decent performances from all three midfielders, they each got a goal and 31 points between them. A couple of goals for Salah and a star man award. Aguero got on the scoresheet against Burton, adding 10 points in place of the injured Kane who obviously got nothing. Doherty, who was dropped to the bench against Leicester and Wolves don’t appear to be keeping many clean sheets. Aubameyang, hasn’t delivered over the past few weeks and I don’t expect him to start tonight. However Arsenal do face Cardiff in the week. This game week could be his last chance to produce something. Although I do like the look of the Europa League fixtures in February. Sane, simply with Mendy back in contention I wonder if his game time may be limited again. Something to keep an eye on. Game week 22 is going to be a bit of an odd week. FA Cup weekend is always a difficult one for me as I tend to pick players who are key first team starters. These players often get rested during the FA rounds. However there is also another round of Premier League fixtures midweek, which may counteract this. As a result I won’t be using my last transfer despite who starts in the FA Cup. If I were to look at teams with the best fixtures, Chelsea would probably be my pick as they face Sheffield Wednesday in the FA Cup and then Bournemouth in the league. Liverpool don’t have a game at the weekend and then host Leicester so I’d probably avoid bringing in any of their players. Arsenal host Man Utd but then face Cardiff in the league, which could be a good fixture to target. After hosting Burnley in the FA Cup, Man City then travel to Newcastle in the league which could be another good fixture to target. Doherty had time off training last week due to his wife having a baby, hence he was missing from the last starting line up. I would imagine he will be back in this week and their fixtures start to improve as well. Ah that’s good to know – I’ve got a bit in the bank so may look to upgrade him at some point but still cautious about having to bring Kane back in. But disappointed to see Rashford on the bench as whoscored predicted he’d start. I can understand OGS wanting to get the others players match fitness levels up though. Hopefully he can come on for a prosperous cameo. I never trust the WhoScored predicted line ups. Plus they never ever get a Man City line up right. Got Lukaku in one of my teams. Hoping his performance leads to more minutes as could be a good differential. Lukaku had a decent game to be fair, setting up the first two goals. Sanchez though, although he took he goal well, spent most of his time in Maitland-Niles’s pocket. Still a shadow of his former self imo. I’d be delighted if Laporte, Sane and Sterling start. Not sure they will though. Mendy should start I think leaving question marks over Sane. Only played 2/9 together when both are fit. Expect stones and otamendi to be the defenders today. I’d completely agree – could see Sane being dropped today and Laporte rested. Definitely expect Jesus to start ahead of Aguero. Can’t stand FA Cup weekend – my four City players all on the bench. No Mendy in the squad at all? Disappointed to see all of Laporte, Sane and Sterling benched. At least Ederson starts. Last time I ever pay attention to whoscored. Couldn’t be more wrong with their City line-up as RR alluded to. It’s really annoying – FA Cup fixtures always ruin me. Had a good game week myself, the transfers paid off and I increased the lead at the top of my ML. Very happy with the midfield and attack going in to Feb and can’t spot anything I’d change immediately. I have the funds to upgrade Doherty to VVD in Feb if I need to. Also keeping an eye on Auba. I took him out for Rashford which proved dividends, but the Europa fixtures may tempt me. Just food f for thought for now, don’t envisage any changes any time soon. Looks good to me. Do you think you’ll plan on putting Kane back in? Sutton Chris, what’s the latest in ur poll, as a replacement for Kane. Aguero came top, followed by Aubameyang and Higuin in joint second, then Pogba had a couple of votes and Firmino and KDB has one each. No votes for Mane or Jesus. I suppose Son could come into reckoning, risky Higuain but good fixtures could pay off handsomely especially if your source says he is eligible for Europa league. South Korea got ko’d son will be back for midweek Prem game! Spurs got good fixtures! Think he’d b a good choice for anyone with transfers left ! Any thoughts? He could do well but I’m personally happy with my front line. Yep!!! His fixtures look good even if he don’t keep a clean sheet. I must admit I thought he scored an OG when I seen Docherty on the score sheet for Shrewsbury. Interesting fact: Doherty has scored 4 goals this season, all of them have been away. Even got star man when wolves lost at Brighton. So always look forward to the away games. When you see he’s the 7th best scoring defender in the game, it’s going to be tricky to remove him. As I’ve said before, they hit some tricky fixtures when the Chelsea game comes around so I may move him out then. I’d have no hesitation bringing him back though once the bad fixtures clear and if he maintains good form. He must be the top scoring defender in terms of attacking returns. Yeah, it just proves that not all the highest scoring players in the game come from the big clubs. Some bargains are out there. Debating whether to test the waters with Higuain as have 2 transfers left still this month. I swear I’m scared to use them this season. I think it’s cause I’m trailing and waiting to see what others do to counter it. If he’s match fit I can see him hitting the ground running. Chelsea have been crying out for a decent centre forward for a while now so he could well be the answer as long as he adapts to the physicality of the PL. Pretty poor GW so far, the beauty of the cup fixtures eh. Goals from Auba and Richarlison hurt me in my ML, but not overly concerned as I believe my replacements will be better long term. Let’s hope Kepa and Hazard both start this evening. You could have a chance of Kepa playing but I’d be astounded if Hazard starts this one unfortunately. Sarri has already said there will be many changes for this game. 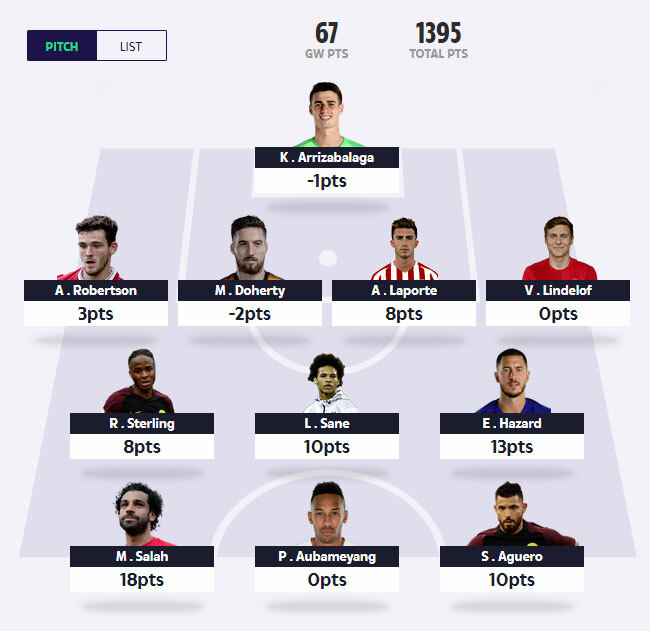 I thought I had Man city covered with Sane, Stirling, & Laporte, the guy leading my mini league had a fifty pt lead on me, which turned into 109, he has 9 City players, that is maybe not unassailable, but I will look back on this weekend as pivotal, only 25pts off 2nd place, keep batling on, but that was a dagger thru the heart, Son or Higuain next move, anyone got any ideas. Plenty of time yet David and you can easily make up that gap with a few decent gameweeks on the spin. Hearing rumours that Son has been suffering from fatigue so I’m not sure if he’ll be straight back into the swing of things. Higuain could pay off as he’s a proven goal scorer. You don’t fancy Aguero David? Or are you wanting to steer away from what your ML rival is doing? Looking to take Maddison & Kane out straight away, Pogba back on his game so he goes in, already have Rashford, so that’s Man utd covered, probably just fall short of attaining Aguerro, the guy leading the mini league has Jesus, for the extra outlay Aguerro would have to outscore Jesus, I’m not sure that is going to happen, so it’s Higuain a possible 6 fixtures, but some tough ones in their, or Son with 5 better fixtures, retaining one transfer to monitor Sane gametime, will have funds for De bruyne if need be, thanx for advice. I have a similar issue with my mini league. The lad at the top has 8 Man City players and 10 points clear but not convinced this can be sustained, as a couple of them are not first team regulars (Danilo and Stones). Do I try and match him or stick with a well balanced side? ( I do have 4 Man City already? SteveB, the guy leading my mini league also has Stones Mahrez, & B. silva, I have Stirling, Sane, & Laporte, 0pts against Burnley, he still got 59 pts, massive swing, got 10pts off Azpilcueta, so gap 100pts, lots to do, to turn that around, best of luck & hopefully good judgement in your mini league. Can’t believe Higuain didn’t take that penalty when he should have. Not happy about that as I’ve just put him in. Would of been a nice start! DTT, I feel your pain!! We have the same 4 city players who were benched. I’m just grateful that Jesus only bagged one and Aguero managed to grab a goal too. Yeah it was a relief in the end with Aguero getting and goal and Doherty picking up some points late on but it could have been an absolute disaster again. These FA Cup weekends really cost me. Who is that one player that you guys haven’t owned at any point this season and regret doing so? Mine is Azpilicuita. I’ve not had any Chelsea defensive coverage this season for one reason or another and this guy scores well both defensively and offensively. It also hurts me even more as two of my main ML rivals have been reaping the benefits of owning him also. So who’s that one player that gets to you most weeks? For me it’s got to be Alisson – at times I’ve had most of the other players but these Liverpool clean sheets always do me damage. I’ve had Van Dijk briefly otherwise it would have been him. I’d agree with that. Mine is Chelsea coverage too. Whilst Alison has been an excellent points scorer as far as keepers go, it tends to be the outfield players that can cause you the most damage (if you don’t own them). The likes of VVD and Robbo have caused serious harm if you haven’t owned them this season. I brought Alisson in some time ago when Ederson went to pot, but it looks like City may have finally turned that defensive corner at last! What a terrible patch that was!! It’s quite interesting when you think about it and It goes to show that you can run really bad in this game, make plenty of errors and have awful luck, but still manage to do well in mini-leagues! Obviously when we talk about overall ratings, there is less margin for error and you need to run an almost perfect season with a tremendous amount of luck to hit the top 10, but making errors in mini-leagues is so much more forgiving! Oh well, still confident in the long term for my team! Mixed results for me – big jump on the leaderboard at the moment but felt like it was an opportunity missed with the likes of Sterling, Sane and Laporte doing nothing tonight. I’ll take a Lindelof goal all day long though. Yeah you must be chuffed with that! Swear he won star man with that goal too but just seen it went to Woods. Of course person below me had my former transfers Richarlison and Auba 😂. Still have a healthy lead at top but reduced by over 30 points this week. Yeah I thought he got star man – hate it when they do that after the game. To be fair he probably didn’t deserve it. Hoping for a low scoring night tomorrow now for everyone else. Pogba or De Bruyne for February? Pogba may have picked up an injury Steve. Keep your eye on that. Thanks for the info, that’s made things slightly easier. Well yesterday was a bit of a disaster and I’m not referring to Dream Team. The old man only went and had a heart attack didn’t he out of nowhere. He’s had a stent fitted and is now hopefully through the worst of it. One hell of a day. Hope your old man is okay and on the mend! Stay positive Chris, hopefully hes over the worst. Sorry to hear this Chris. Hopefully he’ll be back on his feet very soon. Urrrgghhh…horrible news!! I hope he’s ok Chris. Sorry to hear that Chris. Best wishes. Sorry to hear that mate! Best regards to your dad and hoping for a speedy recovery! Sorry to hear. Best wishes for a speedy recovery. I know this is very late, but I’m so sorry to hear that. I was flying that day and have had little to no Wi-fi so just catching up on all. Sending all my love and best wishes. Sorry to hear your news Chris, here’s to a quick recovery. Sorry to hear that chris, Hope your dad has a full and speedy recovery. Sorry to hear the news Chris. Best wishes. Hoping for you dad to make a speedy recovery. I’m liking Aresenal’s fixtures for February, other than this weekend as they have City away, but Newcastle breached their defence twice last night, do we favour Aubamayang or Lacazette, 2 comfortable games in Europa league & all win able league games, I need to know who is going to get more gametime, a lot of ground to make up in mini league, appreciate any input. Also thinking on the same lines. Aubameyang you would think is the main man but I feel tempted again by Lacazette due to his price. What a terrible night for points last night!! Unless you own Son or Mane, I can’t see where many people would have got points from. Having no Chelsea coverage, I was happy to see Chelsea concede so many though. Thinking ahead to Feb transfers, Pogba is a player I want in my team. Anyone know what injury he picked up the other day? Is he out for long? Physio room say it’s just a knock and should be back for the weekend hopefully. Yep was pretty bad. I still have 1 transfer left and 1.3m ITB but don’t know what to to with it. Was either thinking Eriksen to KDB or even though I’ve just put Higuain in change to Son. Any thoughts appreciated. I took the risk on Higuain in my Telegraph team (where there’s no such restrictions on monthly allocation and player locking), ahead of Chelsea’s cup match against Sheffield Wednesday. I know he’s only played two games, but so far, I have to say that I’m not that impressed! It’s not the sort of risk I would have taken in The Sun version where there are transfer restrictions and I’m sure he will come good at some point, however I’d tend to agree that Son seems like a better choice. He’s a proven goal scorer of late and with Kane out of the picture, he’s bound to be picking up points. Thanks for the feedback Lee H. I probably should of waited to see what Higuain was like first but trailing in my mini leagues so took a gamble. Just feel like he needs more of a chance. With KDB having two extra fixtures in Feb compared to Eriksen that was my reasoning. Hard one I just can’t decide but not got much time left. Sounds like a good switch to make. KDB is getting more game time at the moment, even in the lesser games as Pep seems keen to get his fitness up. There’s every chance he may play all games in Feb if he stays fit. Need ideas for transfers for gameweek 23… I have 1.2m in the bank. Salah is a must in my opinion, but I think Huddersfield at home is a better fixture for Hazard can westnham away for salah so suggest waiting till next week to do that change. I’m also considering hazard out as want Pogba. May keep him though and change sane for Pogba at some point when Mendy is fully fit. Personally, I will be keeping him for now for the same reasons that DTT was keeping hold of Mane… high ownership in my mini-league! I’m currently top of my ML (somehow! !… having a pretty poor season) and you have to go all the way down to 13th position before you find someone that doesn’t own him. For that reason I’ll be keeping him for now, but I’m monitoring it and if he really falls off the radar then I will reassess my options. I have already taken him out in my Telegraph team, but then it’s not a huge issue in that league as you aren’t restricted with subs.